Comet 215650A Fixed Cam face for Comet 20/30 Series Driven Unit (20 Degree). Home > COMET INDUSTRIES BELTS > COMET 203599 (A or DF). 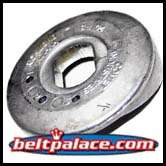 OEM BELT 994-130 for Comet 30 Series. > BANDO 203599 (A-DF), BANDO Hi-Performance belt for Comet 30 series. OEM Comet Industries Belt 994-130. > Comet 216168A - Single Pack "Yellow" 30 Series Driven Clutch Torsional Cam Spring. > Comet 215650A Fixed Cam face for 20/30 Series Driven Unit (20 Degree). 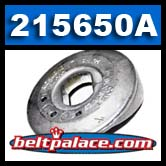 Comet 215650A Fixed Cam face for Comet 20/30 Series Driven Unit (20 Degree). Comet Industries Replaces OEM Torq-A-Verter 215650-A (See Parts Diagram #5).